Hannah Arendt was one of the foremost political thinkers of the twentieth century, and her particular interests have made her one of the most frequently cited thinkers of our time. This Companion examines the primary themes of her multi-faceted work, from her theory of totalitarianism and her controversial idea of the 'banality of evil' to her classic studies of political action and her final reflections on judgment and the life of the mind. 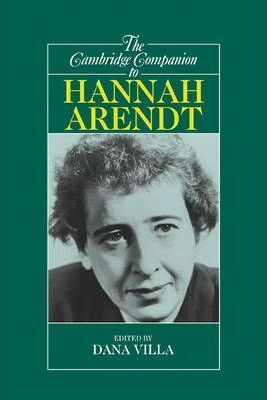 Each essay examines the political, philosophical, and historical concerns which shaped Arendt's thought, and which prompted her to become one of the most unapologetic champions of the political life in the history of Western thought. Introduction: The development of Arendt's political thought Dana Villa; Part I. Totalitarianism and Nationalism: 1. Arendt's theory of totalitarianism: a reassessment Margaret Canovan; 2. Arendt and nationalism Ronald Beiner; Part II. Political Evil and the Holocaust: 3. Arendt's Eichmann in Jerusalem Seyla Benhabib; 4. Arendt and the Holocaust Mary Dietz; Part III. Freedom and Political Action: 5. Freedom: the priority of the political Jerome Kohn; 6. Political action: its nature and advantages George Kateb; Part IV. Arendt and the Ancients: 7. Arendt's Hellenism J. Peter Euben; 8. Athens and Rome Jacques Taminiaux; 9. Equality and elitism in Arendt Hauke Brunkhorst; Part V. Revolution and Constitution: 10. Arendt's constitutional politics Jeremy Waldron; 11. Arendt on revolution Albrecht Wellmer; Part VI. Judgment, Philosophy, and Thinking: 12. Arendt's theory of judgment Maurizio Passerin d'Entreves; 13. Arendt on philosophy and politics Frederick M. Dolan; 14. Arendt on thinking Richard J. Bernstein.